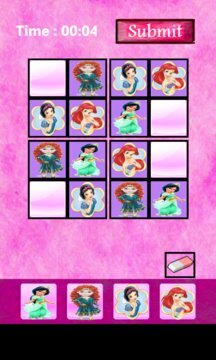 Princess Sudoku is a logic game which is suitable for kids. 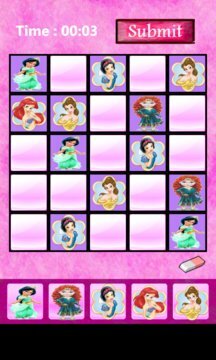 The game is played with pictures of gorgeous princess in beautiful dresses. Game designed for the kids to improve their logical reasoning, IQ and attention skills. Game is a easy version of Sudoku. There are two game modes 4X4 and 5X5. The 4x4 puzzles are the simplest kid Sudoku.